IrisLogic provides testing solutions that best meet the needs of your organization and make the most appropriate use of your resources. Our Irisians can custom tailor the testing process according to your specifications. 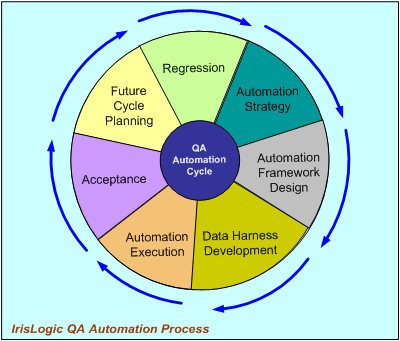 For the IrisLogic automated testing solution, a testing tool replaces the actions normally taken by a human tester. Such actions are included in a programmable script, which functions as the controlling program. Once scripts are developed, they can be run repeatedly with minimal or no manual intervention. This is one of the advantages of automated testing – the process is highly reliable since the tests run as intended with no human involvement. Scripts can be used to record a set of mouse clicks and keystrokes, which cause a particular error. Functionality changes to repair errors can be easily tested by running the same error-producing scripts until the error is fixed. The IrisLogic approach allows for minimal maintenance of test scripts and test plans with every iteration of the software development process. The manager component of the testing tool directs the test plan and can be used to co-ordinate test runs. Reports are automatically generated to effectively communicate the results and errors. Our approach is also flexible. Test scripts can be run manually and then switched to the automated feature to test a modified version of the application. IrisLogic provides the test scripts and the required training and documentation as part of the knowledge transfer.